A radio station in Copenhagen has had its broadcasting licence taken away for three months after calling for the extermination of Muslims. 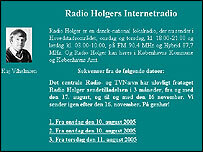 In the controversial broadcast, Radio Holger presenter Kaj Wilhelmsen said: "There are only two possible reactions if you want to stop this bomb terrorism - either you expel all Muslims from Western Europe so they cannot plant bombs, or you exterminate the fanatical Muslims which would mean killing a substantial part of Muslim immigrants." Following the London bombs on 7 July, at least three extremist websites have warned that Denmark could be the next target. The reason for such threats is the 500 Danish troops working alongside US and British troops in Iraq. Danish police have warned people to be more vigilant and have put more police officers on patrol. Police are particularly visible in the centre of the Danish capital, Copenhagen, and around the Metro train system. On Tuesday, the Danish Radio Licence Commission ruled the programme in breach of the Broadcasting Act and decided to withdraw the station's licence for three months. But Kaj Wilhelmsen has vowed to fight on. He says he will continue to broadcast on the internet, for which no licence is required. "Local radio is only one type of media and we will use the media available," he said. The radio presenter also said he would sue the members of the Radio Licence Commission for blocking freedom of speech. In a separate development, Copenhagen Police charged Kaj Wilhelmsen with breaking the anti-racism law which makes it illegal to incite hatred against groups on the basis of religion, race or sexual orientation. Henning Koch, a legal expert from Copenhagen University, told Danish Radio he believed Kaj Wilhelmsen was in serious breach of the anti-racism law and faces a possible prison sentence. Since the bomb attacks in London, there has been an increased focus on extremist groups in Denmark. Only last week, the spokesman for the Danish branch of Hizb ut-Tahrir, Fadi Abdullatif, was charged with calling for the killing of the Danish government. On a flyer distributed in Denmark, Hizb ut-Tahrir said: "So, travel to help your brothers in Falluja and exterminate your rulers if they block your way". Danish Justice Minister Lene Espersen is looking to find a legal way to ban the organisation. Those kind of remarks "have no place in our society", said Mrs Espersen in November. 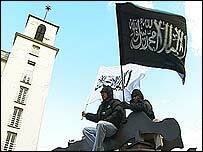 Hizb ut-Tahrir has already been banned in neighbouring Sweden and Germany. Copenhagen Police is also investigating another extremist group, according to Politiken newspaper. The paper says the group is linked to a Copenhagen mosque and its website provides links to an al-Qaeda recruiting video showing Osama bin Laden calling for the killing of non-Muslims and demonstrating how to build a bomb.